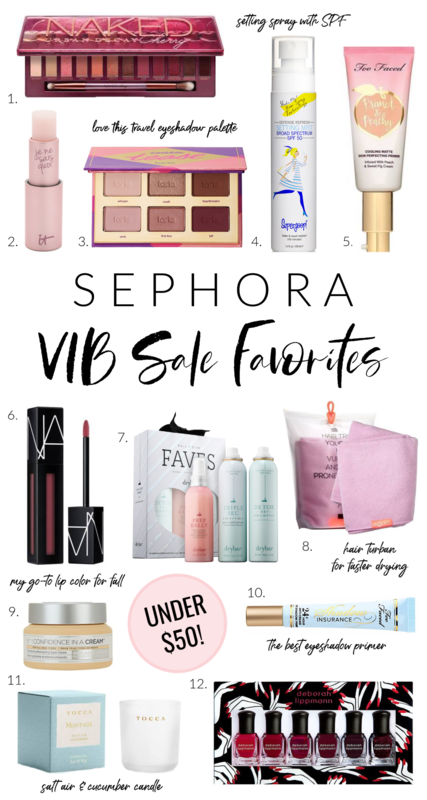 Beauty junkies unite- the Sephora VIB sale is here!! It’s that time of year again to stock up on your beauty faves, grab a few gifts for your girlfriends or splurge for that high ticket item that’s been on your wish list forever. Everything (!!!) will be 20% off until Monday, November 12th with code VIBBONUS. Today I’m rounding up my favorites under $50 and I have all but two of these items so I promise they’re good! I’m still going strong with my original Naked palette but I’m loving the bold colors in Urban Decay’s newest cherry version. With this brand you can be confident that you’re getting a high-quality product with lots of pigment. I’ve been using this ‘Je Ne Sais Quoi’ lip balm for a few years now and I keep reordering because it’s super hydrating with just a hint of color. I used to use the Fresh Sugar balm but I honestly like this one better! I got this palette a few months ago before a trip and it is the best for travel when you don’t need to bring along all the colors in your regular palette. It’s also a steal at under $20! This product is a double threat as it sets your makeup AND provides sun protection with SPF 50. This is the perfect way to reapply sunscreen throughout the day without messing up your makeup (because putting it on just once in the morning isn’t enough!). I discovered this product through one of my favorite beauty bloggers, Lindsey Regan Throne. She is a makeup artist and I take note of products that she recommends over and over again and this one is a winner! I never really used primers as a part of my makeup routine but got the sample size of this one to try out and it has made my makeup look so much better! I have tested a LOT of dry shampoos and I have to say, I haven’t found much better than Drybar Detox. I have pretty oily hair and have found the most success with this one- it’s a little pricey but so worth it. This set also comes with the Triple Sec (texturizing/volumizing spray) and styling/heat-protectant spray. This company actually sent me a hair turban to try out a few months ago and now I won’t dry my hair without it! It’s SO much better for your hair than wrapping it in a heavy bath towel and it cuts down on frizz and drying time. This is my go-to moisturizer for the wintertime because it’s a little on the thicker side and smells amazing! Our skin has different needs as the seasons change so make sure you’re using the appropriate amount of moisture. A word to the wise, if you’re wearing eyeshadow without primer… stop now and get this stuff! If you want your shadow to look amazing all day and stay in place without getting creases, a primer is a must. I actually just got the mini size of this candle in my Glossybox and as soon as I smelled it I was in love!! The scent is ‘Salt Air & Cucumber’ and it’s so fresh and airy. As a self-proclaimed nail polish junkie, I have gotten a few of Deborah Lippmann’s polish sets in the past and have always been impressed with the colors and quality of polish. Red polish is a classic and love the color palette of this set! Ooo i didnt know they had another sale on right now! Ive been meaning to try out that Cherry palette, I think I’ll order it now! Oo these are great finds! Love it when Sephora has sales! I need that Naked palette and the NARS lippie! Love a great sale! So many great finds. You won’t believe it but I have not bought any make up this year. That naked palette is going to make its way into my cart! I just received the Naked Cherry in a press package and I am SO excited to try it, otherwise I would’ve totally bought it! Such a good sale to stock up!! I am in love with that Cherry palette! I just got one a couple weeks ago and have been using it non-stop! I just spent so much money stocking up at this sale! That Dry Bar set has all of my favorites! One of my favorite sales!! That IT Cosmetics lip balm is one of my favorites! I’ve been dying for that Naked palette! one all the pink tones in it!